As our ‘About’ page says on the website “Kb started over a decade ago when Jonathan Kaiser was given a large box of home brewing equipment. 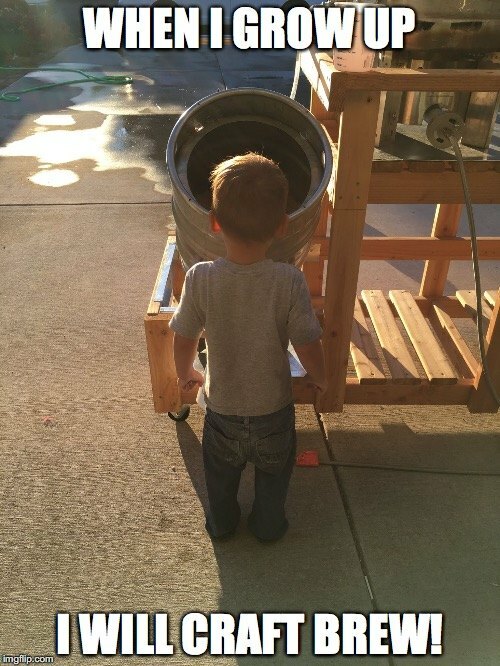 That box sat in his garage for a few more years and he was about ready to sell it when his wife, Wynter, suggested he try making one batch first…And it was love at first brew! Our motto is Community, Fellowship and Good beer and we stand by that. Our model is not one surrounding the typical Brewery / Public House (BrewPub) out there today. First, we are nano in scale. There are no kitchens, no food, not even beer consumption allowed on-site, with the exception of tastings. These are all purposed though, and yes we are licensed by the OLCC and TTB as a BrewPub. But as a BrewPub, we are first a brewery of course, brewing 1-2bbl batches at a time. We also fill containers from 32oz, up to 2gal, offer direct keg sales, and of course give tastings of what we have on tap. Oh yeah, and all this out of our detached garage. Some might ask why. Why the garage, why nano in scale, why no consumption on site, why a BrewPub instead of just a Brewery, why do fools fall in love? That last one is probably answered by lots of craft made beer. I think to simplify it all, after years of home brewing, hundreds of tweaks, countless hours of reading material to learn from, brewing workshops, start-up courses and collaborations, sensory panels and off-flavor evaluations, and the thought of actually pulling the trigger on opening… We set out to do this without having to go into debt, taking on partners or investors, etc. and figured that if nothing else, I still have my day job, and it would be one hell of a man cave! The garage? Purchasing a building or even just leasing one for a taproom would be costly and incur debt. And many great businesses have started out of a garage. Nano in scale? We purchased what we could, within budget, with the plan to scale over time as our sales revenue grows. We want to allow minors under 21 to enter, especially our own children. We want them to be able to see what starting from the ground up looks like, what it means to work with your hands, engineer and create something. We want them to see options for themselves. Not necessarily brewing, but creative thinking. We want them to witness their family’s hands-on work. To allow on-site consumption and minors we would have to serve food. This is just not feasible at this time. Why a BrewPub if no on-site consumption? Simple. It allows us Special Event Brewery (SEB) licensing, allows us to self-distribute, and to sell other’s beer, wine, and cider as we choose. Why zero-debt at start? Just Google what it takes to start a brewery and then double that cost. Think equipment, staff, buildout, building purchase or lease, insurance, licensing, lawyers, and so much more! If your pockets are that deep then go at it. The other way is investors, backers, partners (at minimum three at $250,000 each!) Can it be done? Yes, and it has been proven over and over, but we are not in a hurry. We have time. And I am not going to put my family in that financial debt situation. So what can you expect from us and where to see us? Our focus will shift with the seasons. During festival, market, and event seasons we will look to be out in those, directly in front of you, in community with you all, with kegs to local breweries as well. When seasons change, and our lovely Oregon weather rolls in and the festivals, markets, events close; we will look to increase our keg distribution to local breweries, pubs, and restaurants. And, well, you will find us in our garage of course, year round, with our kegs stocked and our taps ready to fill your growlers! If you have other questions for us, just let us know. If you want to come for a tasting, just let us know. Looking for us to host or provide our beer selection at a special event? Just let us know. Or if you are looking to fill a growler, yes even if not our own, just let us know and come on by! You’ll find our new hours posted here. Cheers everyone, and thank you for your continued support!